It is a specific insecticide for treatments against Spiders and against the formation ofCobwebs. 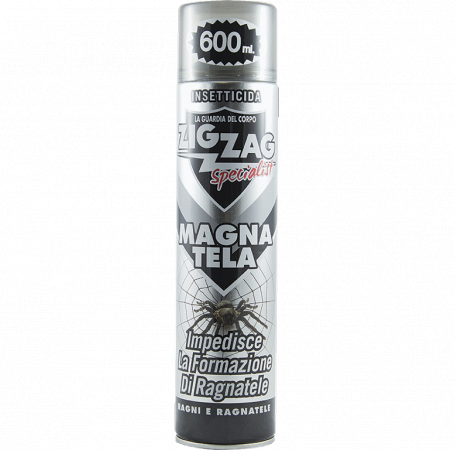 It has a double action: a high immediate effect, with the almost instantkilling of spiders within the first 15-20 sec. by contact, and prolonged residual actionresulting effective even after 40 days of application, resulting in failure to form thewebs. Notes: the only insecticide on the market that prevents the formation of cobwebs andfree from the problem for 40 days! The special valve allows you to reach the farthest corners of the Vs. home, even at a distance of 2.5 / 3 m.
Respect the environment: It does not contain gases and propellants deemedharmful to the ozone layer. Remove any cobwebs present. Shake well before use. Dispense the product in a uniform quantity for a time equal to 3 sec. per sq. in the corners, the edges of the ceiling and floor, behind and under furniture and wherever spiders and crawling insects or transit. The special valve allows you to reach the farthest corners of your home, even at a distance of 2.5 / 3 m. Ventilate the room thoroughly. In the corners, the edges of the ceiling and floor, behind and under furniture and wherever spiders and crawling insects or transit. Foods and food containers. Of flame or any incandescent material.